You scratch with it, once in awhile. The seal comes up close. You wait for the seal to come close before you shoot. Seals are comforted and attracted by the sound of another seal scratching the ice, which this tool imitates. Hunters used it when stalking seals on the frozen ocean, or to lure swimming animals within range. For camouflage as they crept across the ice seal hunters wore white parkas and hid behind large mittens made of polar bear fur. Jane Brower: Kumiunnaq. Kumiunnaq sikumi natchiqsiuġamiŋ, ugruk. Ron Brower, Sr.: This is an ice scratcher, designed to attract seals. These [claws] are the small nails of the ugruk [bearded seal]. Maybe their pinkie [laughs]. Kenneth Toovak: My father used to have two of them. Ron Brower, Sr.: This is a standard one. Some are fancier than this. But this one has something on it, that’s ivory. Some of them have the blue beads. Every man had their different style. Kenneth Toovak: My father used to have two. In the spring, right on the edge of the lead, he just scraped the ice [with it]. Pretty soon the seal come up about five or six feet away from you. That [sound made with ice scratcher] means there’s seals scraping the ice. Some of the hunters when they’re stalking a seal that lay on the ice, they stop and scratch [ice with this]. And then you lay down and come up on it. Keep sneaking closer and closer. And when he [seal] puts his head up a little bit [hunter scratches ice]. 1. 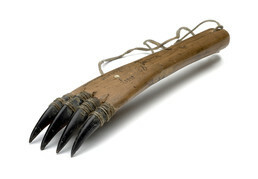 According to Iñupiaq Elder Martha Aiken, the name for this object is sikumun kumiunnaq [ice scratcher]. A hunter uses it when he stalks a seal on the ice. He scratches on the ice with it while crawling towards a seal—a technique called auqtuq—so the seal thinks the sound made by the hunter is another seal. This type of tool, called an ice scratcher or seal call, was used by Iñupiaq seal hunters from Point Barrow to Norton Sound. It consists of seal claws lashed to a short wooden handle. (1) This example, collected by Lt. P. H. Ray at Barrow in 1883, is made with four bearded seal claws and has a wrist strap. In late winter and early spring, hunters in the Norton Sound area stalked seals as the animals slept or sunned themselves on the sea ice. They wore parkas with gray or white fur trim on the hood, knee protectors, and a single large mitten made from polar bear or white dog skin. In the other hand, they carried a gun or harpoon. At first walking, then crawling, a hunter slowly approached the seal, using the mitten and hood to hide his body and to blend in with the background of ice and snow. If the seal sensed danger and raised its head, the hunter stopped and gently raked the ice with his scratcher, imitating a seal digging its breathing hole. This reassuring sound would lull the animal back to sleep. Men along the north coast of Alaska also used ice scratchers or other scratching tools—such as the ice pick on the end of a harpoon—when stalking seals or hunting them along open water leads.